The V > 01 Limber rubber is the slightly softer and more controlled version of the VICTAS V > 01 premium series for ambitious players. The goal of the development of this version was to produce a High-End offensive rubber in the medium segment. The German and Japanese material experts (GJ Tec) combined the extremely spinny and fast High Energy Tension rubber sheet of V > 01 with an open-pore, state-of-the-art medium sponge with great catapult effect. The result is a highly-elastic, modern offensive rubber which does not fall short of the other V > 01 versions as regards power and spin. The "Power & Balance" concept was optimized such that the slightly softer sponge design of V > 01 enables higher ball trajectories, which significantly increases forgiveness in less-than-perfect topspin strokes. In attacking strokes, the rubber provides for fantastic feel for speed plus inimitable speed glue effect. 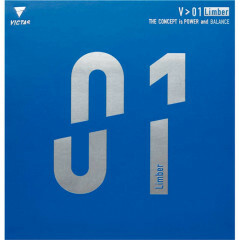 Victas Rubber V > 01 Limber is beeing added to cart.